As a professional organizer, I’ve learned a lot from the trenches of disordered homes across America. Yes, organizing can save time and money. But one of the most rewarding results of ordering your environment is the peace of mind that follows. When we invest the time, energy and resources into restoring order to our space, a new clarity arises. When things are sensibly arranged, we can think straight and operate to our highest capacity. A lot of people mistakenly equate being organized with being rigid and lacking creativity. On the contrary, I’ve observed repeatedly that coming out of a state of chaos and into a state of order actually renews energy and creativity to the person and to her environment. Organization releases clarity of mind to concentrate, express creativity and live abundantly. We all recognize household clutter; nomadic hair tips on the kitchen counter, mysterious socks on the desk, a growing pile of outdated coupons, or the ghastly gifts we feel guilty tossing. Clutter, as I define it, is an assortment of “unknowns.” These “unknowns” are undefined because they either a) have no destination, b) are incomplete tasks, or c) require a decision. The reasons people have difficulty clearing clutter are the very reasons the items have become clutter in the first place! Clutter collectors may have never defined destinations for the items to live or may be dodging the discipline of returning items to their appropriate locations. Sometimes, paper or belongings must be gathered from different locations to complete a project (like tax documents or scattered craft supplies). Other times, clutter develops because of procrastination. We put off unsavory tasks or those that force us to render a decision. Quite often, if we don’t know what to do with something, we just set it aside. The clutter bug often finds herself paying the piper for her nasty little clutter habit. Usually, this comes in the form of missed deadlines or fruitless searches for an item amidst the sea of creeping clutter. By now, the clutter bug has reached “the point of pain.” A decision to face the “unknowns” is made. It would be more painful, the collector determines, to stay buried in clutter than to dig out from the chaos. After reaching this critical, motivating “point of pain,” I’ve seen many clients tackle their clutter successfully. The first step is to define a location for every type of item within the household. I call this purposing your space. Once we’ve assigned a purpose to each space of the home it will be easier to corral clutter. For example, once we know that all hair products live in bathrooms, we must devise a system for returning clips, sprays and combs to those locations. Paper tends to morph throughout the house, so we settle on one or two processing areas for different kinds of paper, usually a receiving area and a final destination. Determining tasks for each room aids in this process, because the items that serve those activities will automatically be assigned a nearby location. Deduction and common sense can be used to resolve the remaining “unknown” items without homes. The second step is to list the projects or tasks that are represented by the creeping clutter and schedule them. If craft and hobby supplies keep popping up in a clutter pile, either they don’t have a home, they are not being returned to their proper home, or they are not being used. Perhaps it is time to retire that craft, or schedule a time to work on it. If advertisements are consistently lying around the house, they may represent our good intentions to redeem a coupon, attend a sale or purchase an item. Whatever the case, we should schedule that task or let ourselves off the hook in the future. 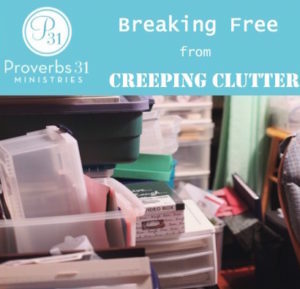 The last, and most challenging step is to make a decision about the individual items that are causing our clutter. This is a psychological obstacle for some. Letting go and pruning back our overage may mean staring down our guilt about unused gifts, or a size that no longer fits. Giving ourselves permission to clear out unimportant items makes room in our life for what IS important to us. And that is what organizing is all about. Most people would love to rid themselves of household clutter, but they’ve bought into the commercialized version of organizing. They think organizing can be achieved with plastic bins and quick fix shortcuts. As a seasons professional organizer, I can tell you these shortcuts never last. If you want to kick clutter out the door for good, you can begin by following the steps I’ve shared and embracing organizing as an investment in your quality of life. Every successful organizing project includes at least three parts: 1) dealing with backlog, 2) setting up improved systems to self-manage in the future, and 3) maintenance. In the case of clutter, by purposing the individual rooms of your home, you can address the backlog. By scheduling and activating tasks related to your backlog, you will begin to address your habits. Finally, by making new decisions to let go and lighten up, you will maintain your hard work and make room in your life for the things that really matter. Vicki Norris, author of “Reclaim Your Life and Get Organized for Good” and “Restoring Order™ to Your Home” is an expert organizer, business owner, speaker and television personality who inspires people to live out their priorities. Norris is a regular on HGTV’s nationally syndicated Mission: Organization, and is a recurrent source and contributor to national lifestyle publications. Adapted from “Restoring Order to Your Home.” Copyright © 2007 by Vicki Norris. Published by Harvest House Publishers, Eugene, OR. Used by permission.